Xtext is a great technology. I really mean it. After 15-30 minutes (depending on your previous domain knowledge) you can get a really fancy textual editor, that parses your text into an EMF model. Xbase is even better: you can simply include Java-like expressions into your language, that can be easily translated into pure Java code. However, while using Xtext I found some minor “paper-cuts”. One of the most problematic of them was the fact that I cannot open my textual models using the Sample Reflective Ecore Model editor, as I get an exception: java.net.MalformedURLException: unknown protocol: java. A similar exception occurred if I tried to open the files programatically (but without the help of the generated Xtext editor). When I asked in the Eclipse forums how to open Xtext model files programatically, I was answered (btw. very quickly – kudos for that 🙂 ) that a specific ResourceSet implementation is needed that refers to model files and classes available in a Java project. And an Xtext generator fragment, that can be used to generate a new editor extension to the ui project (with the corresponding dependency added to the reflective editor plug-in). Add hu.cubussapiens.xtext.reflectiveeditor as a dependency to your language project. Unless the plugin.xml files are updated automatically, you have to copy the newly generated editor extension from the end of the plugin.xml_gen file of the ui plug-in to the plugin.xml file. The simplest way to do this is to select both files, and open the compare editor from the popup menu (Compare with/Each other…), the copy the changes manually. Finally, open the runtime workbench, and open your textual model files from the popup menu using Open with/«LanguageName» Reflective Editor. The result should be similar to the screenshot below. 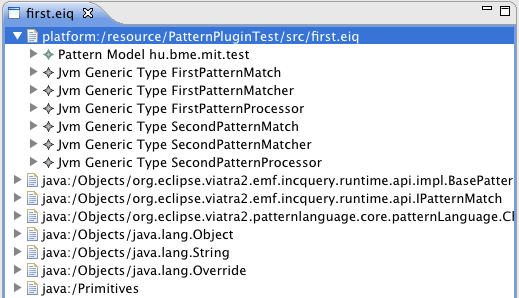 In my case, the editor shows both the domain model generated from the file directly (the Pattern Model element), the inferred JVM model classes (the various JVM Generic Type instances), and also the referred Java classes as external resources (the resources beginning with the java:/ URIs). Version 0.5.3 is already available, and hopefully works well for all languages.